Fibromyalgia is a medical syndrome which causes trigger-point pain and soreness in fibrous tissues such as tendons, ligaments and muscles. Some Fibromyalgia symptoms include stiffness and muscle aches, headaches, chest pain, low-grade fever, swollen lymph nodes, frequent abdominal pain, depression and fatigue or insomnia. Fibromyalgia is not life threatening and many people live happy and fruitful lives with this syndrome. Fibromyalgia has been predominately found in women between the ages of 25 and 45 years of age. Fibromyalgia and exercise may not sound like they go together. Exercising when you are in pain is not an easy task. Any types of exercise should be introduced slowly into their lifestyle. Exercise is an excellent natural way to help with pain, improve strength, flexibility and overall well being. 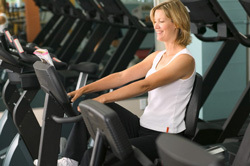 What types of exercise can someone with Fibromyalgia do? People living with Fibromyalgia may benefit from low-intensity exercise. Research has shown that exercise may decrease the severity of symptoms related to Fibromyalgia when compared to subjects who are sedentary. What types of Fibromyalgia exercises constitues low-intensity? t this is accompanied with counseling sessions from a professional. You may start out with a few minutes of swimming each day until that duration has been reached. Walking is another low-intensity exercise which should be attempted daily. Try walking for 5 minutes initially and add 1 minute everyday. Make sure that you increase the time as long as the symptoms are not worsening. Stretching and flexibility are extremely important factors with the overall well-being and good health of anyone.